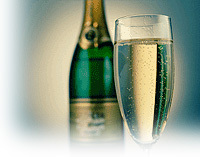 True Champagne comes only from the northern French region of the same name. Produced from only three varietals, Pinot Noir, Chardonnay, and Pinot Meunier, this wine becomes sparkling by the process of creating a second fermentation in the bottle. Flavors reflect the varietals used (whether predominantly Chardonnay or Pinot Noir and Pinot Meunier) although it is rare to have any overt red fruit flavors. Chardonnay-dominant examples are typically elegant and racy, with apple, pear, and citrus fruit and chalky minerally aromatics. Pinot Noir-dominated examples are typically richer and fuller-bodied with mild red fruit aromatics. Both styles can also offer yeasty toasty or creamy notes depending on the winery. Pinot Meunier rarely is a major component, but its flavors resemble those of Pinot Noir. Mild cheeses, caviar, chicken liver crostini, mini-quiches, oysters, sushi. Fruit salad especially strawberries, apple/pear tarts, lemon meringue.